The D Type Midget was in production from the latter part of 1931 to mid 1932 and was derived from the first of the MG Midget range, the M type that commenced production in late 1928. 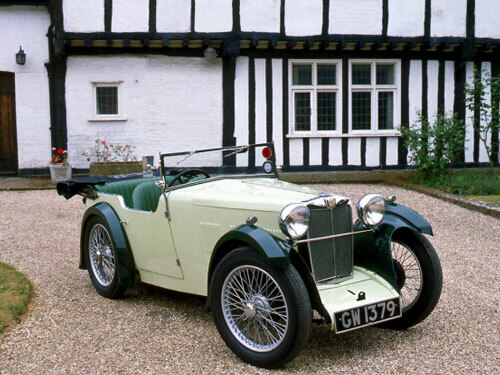 The M type was undoubtedly the first of a long line of MG's that were to make the MG sports car so popular throughout the world and it is impossible to overestimate the importance of this little car in establishing the marque and associating it with affordable and exciting sports car motoring. The M type had its roots in the Morris camp and was loosely based on the Morris Minor that first appeared in early 1928. Cecil Kimber realised the importance of producing an MG based on the Morris which after all was hardly a surprising move as most of the forerunners were Morris derivatives. Launched at the October 1928 Motor Show at Olympia, it was evident that the M type would be a success as there a full order book taken at the show and indeed the car sold very well for the ensuing three years. The car did not go into full production until early 1929 and used mainly Morris components with some modifications. The narrow two seater body and its exterior fittings were the main differences. The main reason for similarity with the Morris Minor counterpart was the fact that once the decision had been taken to produce the Midget there was tremendous pressure to get the car on show at Olympia and there was insufficient time to get individual components manufactured. Kimber had Carbodies of Coventry design the neat two seat boat- tailed fabric covered body and with a distinctive 'V windscreen and louvered bonnet side panels, the car really looked the part. The overhead camshaft 847 cc engine was moderately tuned compared to the Morris Minor and it developed 20 bhp. At a later stage this was improved to 27 bhp but the engine designation of 8/33 as it appeared in the D type could not really be justified with the 8 signifying the horsepower and 33 indicating power output. A feature of the engine was the vertically mounted dynamo which carried the drive to the camshaft from the crank. There were benefits in mounting the dynamo in this way, the main one being the absorption of vibration coming from the camshaft drive with the heavy armature acting as a damper. A distinct disadvantage with this arrangement was that as time went by the top driveshaft seal in the cylinder head would fail and leak oil into the dynamo itself causing charging problems. The top coupling would then deposit generous amounts of oil all over the engine compartment as it rotated causing quite a mess! Building on the success of the M Type, Cecil Kimber saw the potential of promoting the marque through competition and with the move to Abingdon in January 1930 and its improved production facilities and more space, he was able to convince Sir William Morris that the time was right for MG to move into serious competition. Very soon Abingdon began to build the first real racing MG's. A team of five heavily modified M Type Midgets were produced to enter the Brook-lands Double Twelve race where they triumphantly took the team prize. As a result 21 replica double twelve M Types were produced for sale to the public. Following the success at Brooklands and the ensuing publicity, it is fair to say that Sir William Morris could not fail to have been impressed and it is likely that he favoured further development of the racing side which resulted in the production of the C Type racing car. Derived from the prototype EX 120 which was the first MG record breaker, it took the honour of the first 750cc car to exceed 100 mph, and was an out and out racing car. Only 44 of these were produced and Abingdon were ever mindful that the racers could only appeal to a very limited market and that the volume production cars, although benefiting greatly from the publicity and development point of view, they had to take precedence. Many of the racing features were emulated in the volume cars and this along with the racing successes certainly boosted sales. The C Type had many wins to its credit and on its first outing at the Brooklands Double Twelve race in May 1931 it not only one the race outright but the team prize also. Later on in the year, in supercharged form, the C Type won the Tourist Trophy outright which coincided nicely with the introduction of the D type at the London Motor Show in October. With MG publicity riding high the D Type got off to a good start with plenty of initial interest. With a slightly longer wheelbase than the C Type but essentially the same chassis design with the main members underneath the rear axle and tubular cross members. The rear springs were mounted in sliding trunnions rather than shackles and the radiator was carried by the front engine mounts rather than affixed directly to the chassis. Centre-lock Rudge Whitworth wire wheels were fitted and cable operated 8" drum brakes provided the stopping power. The 847cc engine and three speed gearbox with compact remote control unit were taken directly from the M Type as previously described. A rear mounted but enclosed 8 gallon fuel tank supplied the single SU HV2 carburettor via an electric SU pump. The car looked somewhat short and stubby and lacked proportion in the bonnet length although many found the looks quite appealing. It was a heavy car and with only 27 bhp available to propel it, performance was not stunning. The bodywork options available were either closed or open 4 seaters, sadly no 2 seater sports were produced, possibly because the M Type was continued in production at the same time, albeit at a reduced price. The C Type was also still available retailing at £490 or E575 with supercharger, compared to £210 for the D Type open 4 seater, whilst the closed tourer D Type was on sale at £250. The M Type was reduced from £185 to £165 for the fabric bodied version whilst a new metal panelled option was available at £185. Launched at the same time and also based on the C Type chassis was the F Type which carried for the first time a new MG type name, the Magna. This car was greeted with slightly more enthusiasm as it sported a new 1271 cc 6 cylinder engine and an impressive 12/ 70 designation. Wheelbase: Early cars 7' 0" late cars 7' 2"